Pokémon was the first game I actually really got into as a kid, but I was only ever a fan of the Game Boy games and not the Trading Card Game (TCG). I never really found much pleasure in collecting or possessing material goods in general, and that tendency continues on to this day as an adult – I’d much rather have money, knowledge, and electronic possessions rather than large collections of physical souvenirs. The only Pokémon TCG card I ever owned was a random Psyduck that I think a friend gave me for free. I didn’t really see the purpose of owning them, because at that time, I didn’t even know how to properly play the card game. I also thought it was a complete waste of money to own Pokémon trading cards (the magnitude of wastefulness probably also amplified by the fact that I didn’t actually make any money back then). As a small child, my favorite Pokémon was Eevee. I felt like flexibility, adaptability, and diversity was a very important characteristic, and Eevee was able to do that – it could evolve into a fire, water, or electric type. I started liking Eevee even more when Pokémon Gold and Silver came out and I discovered that Eevee could now also evolve into a dark or psychic type as well. I still like Eevee to this day, and Eevee remained my favorite Pokémon for a while – not only because I still liked the concept of Eevee, but also because I didn’t really pay that much attention to Pokémon to really know much about the hundreds of new Pokémon that were being released since the Johto expansion. However, I’ve recently been paying closer attention to the new Pokémon games and the mega evolutions, and I discovered a Pokémon that I think is my new favorite – Absol. One clear advantage that I think Absol has over Eevee is its appearance. If you know me in person, you know that I really like white clothing (most of the casual t-shirts I wear are white, and I have a thing for white jackets). A secondary favorite color of mine is anything on the grayscale spectrum. Our good buddy Absol happens to naturally be both of those colors, all while having a stylish and fashionable fur arrangement and horn accent. Ask me to pick a favorite “real” color that isn’t white, gray, or black, and I will say I like the ferocity and power of the color red … and Absol’s shiny form just happens to be red. Absol also has some empathy-inducing lore behind it. Absol is considered to be the disaster Pokémon because every time people see it come down from the mountains, disasters occur. Surely, Absol is the one causing them, right? Of course, Absol is actually misunderstood – it comes down from its natural mountainous habitat to warn civilization about natural disasters coming because it’s able to sense it, not because it’s causing the destruction itself. Even though I’ve never been a fan of collecting cards, and I still don’t really have much of an interest in doing so, I never said that I was actually against it. In an attempt to explore different opportunities and try out things I never got to do as a child (even though I didn’t actually particularly even want to do this as a child), I decided to start a very small Pokémon card collection of only Absol. Why Absol? I would obviously pick one of my favorite Pokémon, but I decided to go with Absol instead of Eevee because I didn’t want to create a snowball effect of wanting more and more Pokémon cards. My mission is to try and collect all the Absol cards, and once that is complete, I can put the project on hold, admire my collection, and wait until more new Absol cards come out in future expansions. 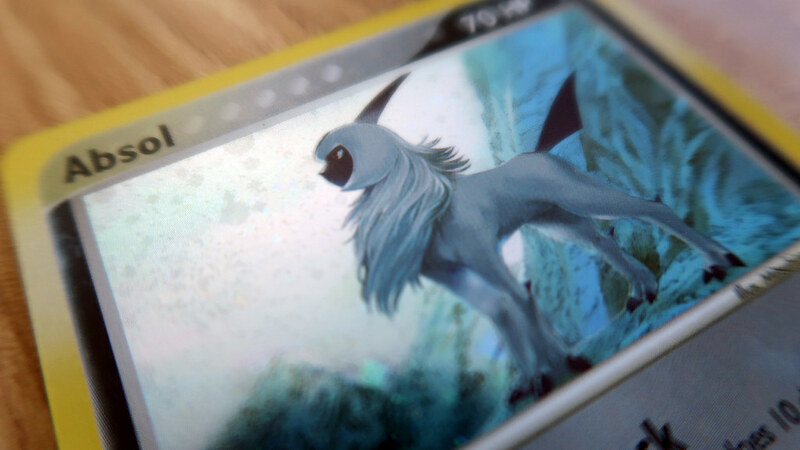 If I were to do that with Eevee, I would have a very easy progression to wanting to collect all the Eevee evolution Pokémon cards as well, and I’m trying to do this as a side hobby purely for fun, not to drain my entire entertainment budget into it. 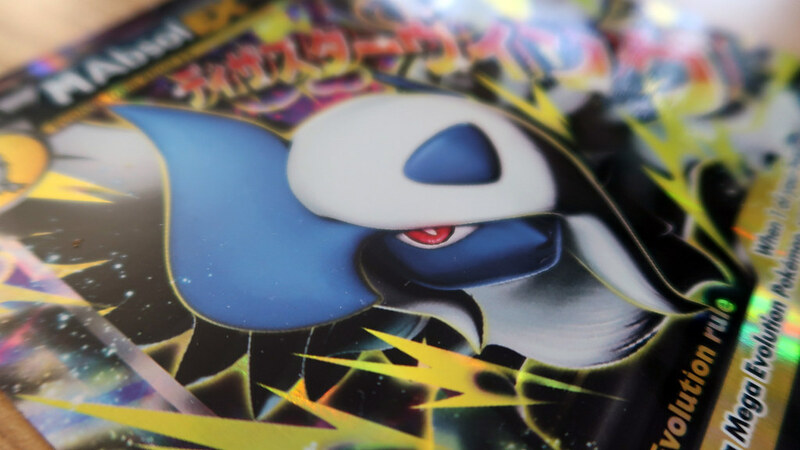 And even then, Absol still has quite a few cards available; not only are there multiple versions of Absol printed, but all of them come in different languages as well. I’m looking to spend no more than about US$100.00 on my initial purchase (which would include a binder, sleeves, and as many cards as possible), then spend no more than about an hour a week searching for good deals on card vendor and auction websites to try and round out my collection. I would imagine that the time investment would start waning down to just a few hours a month once I get a hold of all the cards in common circulation, and have narrowed down the empty slots in my collection to just rare foreign cards. 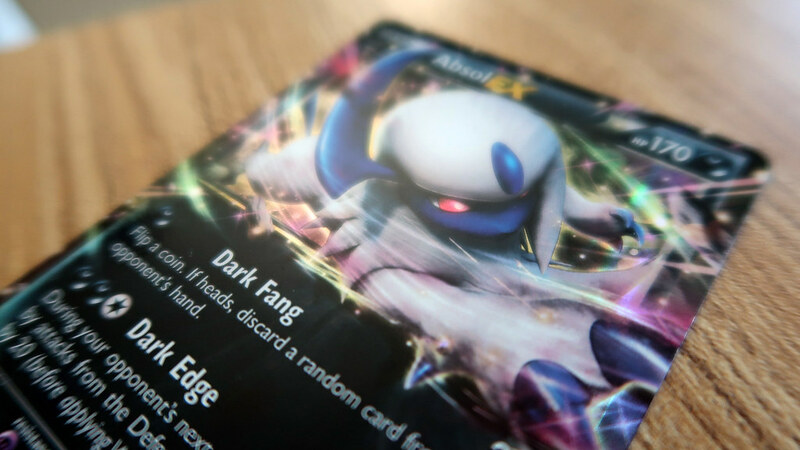 When I want to do something, I tend to go all-in, so I spent a bit of time doing some research on all the Absol cards in print right now. I’ll be using this as a reference for how much more progress I need to make to complete my English and Japanese collection, before moving on to foreign languages (which I’m finding may include, but is not limited to, Korean, Spanish, French, German, Portuguese, Italian, Polish, Dutch, and Russian). I also have the cards listed in order of release date, which is how I will be organizing my physical collection. I’ll be coming back to this blog post once in a while and making some edits to the table – checking off cards I purchase, and adding more cards that I discover exist. As long as you haven’t just been completely disconnected from the Internet for the past few weeks, you probably know of Pokémon GO, the new augmented reality game that uses GPS to inject Pokémon into the real world and encourage you to get out and hunt for Pokémon. Although I’ve been a fan of Pokémon since I was a little kid, I never really got into Pokémon GO because of how busy I am. During work days, I watch our family business and do a lot of other work, so I end up having no time to go outside and look for Pokémon or battle at gyms. During weekends and off days, I usually still do even more work online, and use all remaining time to rest and relax. On top of all this, it doesn’t help that it’s been pretty hot outside. Nevertheless, I got persuaded to go outside and go on a Pokémon GO gym run today by Mike. If you’ve been reading my blog posts lately, you probably remember him – he’s one of the masters and co-owners of Keumgang Martial Arts Academy, and he’s in quite a few of the photos I’ve posted recently of the albums and videos I filmed at demonstrations and events. The nearest Pokémon GO gym to the martial arts academy is a water tower nearby, so Mike and I walked over there. This gym was occupied by Team Mystic (which is our team), and was guarded by Pokémon with combat power of over 1,000. Unfortunately for me, I don’t actually play that much, so I only had Pokémon with combat power of 100 or less. Meaning, this trip was almost entirely useless for me. Apparently battling Pokémon of your own gym is supposed to help train you, but that was obviously not happening, because I wasn’t able to defeat anything. Mike, however, plays this game a substantial amount more than I do, and so does Chris, the other co-owner of the martial arts academy. When we came here, Mike brought Chris’ phone as well, and he was playing on both phones at the same time. But, as we were battling the gym and trying to raise our prestige, we noticed that it was falling faster than it was rising. I walked over around the corner of the fence surrounding the water tower, and noticed that there were other Pokémon GO players sitting on the ground against the fence, presumably trying to take over our gym. But, Mike wouldn’t have any of that. Once the gym got neutralized, he reacted quickly by putting in one of his own Pokémon into the gym again, stealing the “claim” away from the other team that had just defeated us. Moments later, I notice the other guys rage quit, get up, and walk away. 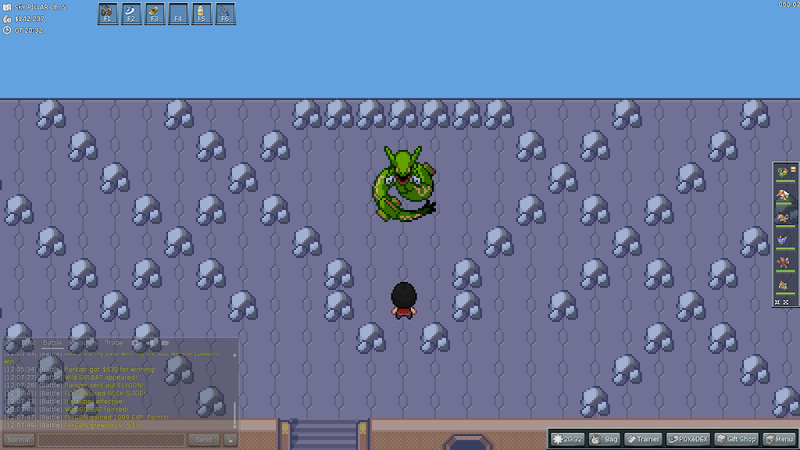 Way at the beginning of this calendar year, PokéMMO implemented Emerald version support and expanded their storyline to include both Kanto and Hoenn. Although I’ve been a Pokémon fan ever since I got my first Game Boy Color and Pokémon Yellow cartridge back when I was an elementary schooler, I’ve never actually fully played through the Ruby, Sapphire, and Emerald storylines. When I was a second-year high school student, I played the third generation games a bit, but I used a wall hack so I didn’t really get to experience it fully. 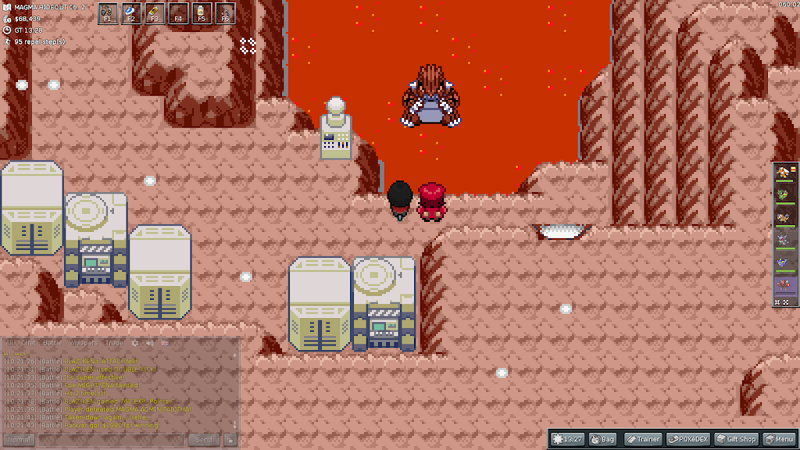 I was excited at this opportunity to play through Pokémon Emerald through PokéMMO, but never really got around to doing it until now. I’ve been playing the new expansion little-by-little throughout the year, but in the past week or so, I’ve been playing it a lot more with the intention to actually make progress. I’ve managed to get through the entire main storyline so far, and all I have left now is getting through the Hoenn Victory Road and defeating the Elite Four. As I got deeper into the storyline, I took some screenshots along the way. After saving the Hoenn region from the two legendary Pokémon by recruiting the help of Rayquaza from Sky Pillar, I proceeded to Surf to Ever Grande City to finish my journey. As the episode begins, the heroes are walking through a forest, not quite sure as to where they are. As they try to navigate their way to the closest Pokémon Center, they hear a Pokémon crying out for help. They rush over to find a Snubbull being bullied by a Hawlucha. Ash reacts quickly and tells Pikachu to use Thunderbolt. Suddenly, a Gallade appears out of nowhere and gets surprised by Pikachu’s attack, causing it to fall over and hurt its ankle. Unexpectedly, the Snubbull Ash was trying to protect leaps out and attacks Ash. The adventurers then realize that they were interrupting a rehearsal, and the bullying was just an act. The adventurers apologize to the theater director, and he explains that they are practicing for a show. At the Pokémon Center, Gallade comes out with a cast and crutches. Nurse Joy says that Gallade needs a few days to rest, and he won’t be able to participate in the show. Ash makes a compromise, and offers his own Hawlucha to take Gallade’s part so the show can go on. Unfortunately, Ash’s Hawlucha doesn’t understand that this is an act, and tries his best to avoid Dark Haw­lucha’s attacks and defeat him. This angers Dark Hawlucha, and on the next iteration of practice, they both start fighting each other. In the background, Team Rocket is watching rehearsal through binoculars, and plan on capturing Haw­lu­cha. Later on, the adventurers see Dark Hawlucha practicing its dives, and the theater director explains that Dark Hawlucha used to be a Kalos Region Fighting-Type Tournament Champion, and the passion with which it now performs. As they continue to practice and the day comes to a close, Ash is confident that both Hawluchas will put on a great show. The next day, the stage is full with people eager to watch the show. In the crowd is Team Rocket, with Jesse eager to take the stage. They storm the stage and put on their own show, confusing the crowd. When confronted, Team Rocket reveal their identities and call out their Pokémon to begin a battle. Pikachu takes a direct hit and is taken out of the fight, leaving only the two Hawlucha left. They team up together, comboing their moves and sending Team Rocket blasting off. The main event begins, and Ash’s Hawlucha gets nervous and falls down from its perch. Unexpectedly, Dark Hawlucha helps Ash’s Hawlucha up, and they engage in a duel. The setting transforms into a fighting ring. Ash’s Hawlucha and Dark Hawlucha brawl, and the crowd goes wild at the passion and realism with which they are fighting. Ash’s Hawlucha does a dive as its finisher, but Dark Hawlucha dodges the attack. They then both strike each other in mid-air, and Dark Hawlucha falls, with Ash’s Hawlucha being crowned as the winner. Ash’s Hawlucha shows great sportsmanship by helping Dark Hawlucha up, and the crowd goes wild. The episode comes to a close with the tournament director and his crew packing up and moving on to the next show. The adventurers are shown waving goodbye, and their journey continues. This episode touches on two key messages, the first being that you can’t tell what someone has gone through just by looking at them. In Dark Hawlucha’s example, most people wouldn’t imagine that someone who is a theater performer, putting on shows on a stage, is a regional champion fighter. Just because you see someone doing something and acting in a particular way doesn’t mean that you auto­matically know their full story. Being closely involved with martial arts myself, both as a practitioner and coach, I know from experience that people who look frail and weak on the outside have put in years upon years of work to learn how to use their bodies to be deadly. You never know what’s going on with someone behind the scenes, and it’s usually in your best interest not to be ignorant. The second is that acting is pretty difficult. A lot of people think they can go out and act and be great at it, but often times, it’s very easy to see that it’s not very genuine. There is a level of emotion and passion that comes out when something is happening for real, and it takes a lot of work and skill to be able to do that in an act. During the Pokémon show, Ash’s Hawlucha got stage fright and ended up not being able to do his role. However, when they switched on to genuine fights (against Team Rocket, and against Dark Hawlucha), Ash’s Hawlucha began to shine. He was no longer acting, and instead, his true emotions were coming through in his performance. When someone has a real interest in what they’re doing, it’s easy for spectators to see the real passion coming from the performer’s movements, and this is what made the show great and the crowd go wild. The episode opens with the adventurers eating. May has some dessert, but they realize that Chespin has taken all the food gulped it down. Pancham gets angry, and initiates a long fight with Chespin that neither Serena nor Clemont are able to subside. During their fight, the two Pokémon encounter a trainer whose Pokémon they accidentally tackle. After Ash apologizes, they find out that this trainer is preparing for a Pokémon Showcase. Serena agrees to watch the trainer and her Smoochum and Farfetch’d perform and give them feedback; after the demonstration, the trainer jots down comments in her notebook. Next is Serena’s turn, but Pancham and Chespin still aren’t friendly, and Chespin interferes. To solve this, Clemont pulls out a new invention – a robot that will dance with Chespin. As expected, the invention explodes. While Serena is showing off her performance, Team Rocket is nearby, watching through binoculars. Jesse wants to catch Smoochum so she can win the Pokémon Showcase herself. Serena’s demonstration ends, and she receives some feedback. They then realize that Smoochum might have a crush on Pancham, and have them dance together. They synergize so well that Serena is offered a trade for Pancham, but Serena declines. Out of nowhere, a disguised Team Rocket arrives and offers to help the adventurers choreograph a performance. After a bit of warming up, Jesse convinces the Pokémon to step into a balloon trap under the false pretense that they would be practicing dancing with efficient movements in a small space. Team Rocket then flies off in their hot air balloon, leaving a smokescreen bomb behind to cover their tracks. However, due to Chespin and Pancham’s continued fighting inside the balloon trap, the motion breaks them loose from Team Rocket’s escape and sends them falling to the ground. Shortly after, Team Rocket finds the fallen Pokémon and attempt to recapture them. Due to Pancham and Chespin’s relentless fighting, all their allies get hurt from Team Rocket’s attacks. Pancham and Chespin finally realize that they need to work together in order to fight against a common cause, and combine their efforts to throw attacks at Team Rocket’s Pokémon. They stall for long enough that the adventurers find their Pokémon. The heroes give the final commands to their Pokémon to finish off Team Rocket, sending them blasting off. Unfortunately, now that the threat is gone and Team Rocket are no longer there, Pancham and Chespin begin arguing again. As the episode comes to a close, the adventurers bid farewell to their new friend, wishing her the best of luck in her future Showcase. Not everyone demonstrates friendship the same way, and the same action may seem dif­ferent from dif­fer­ent perspectives. As was apparent by Pancham and Chespin, from the outside looking in, Pancham and Chespin look like they’re always fighting, but from their own perspectives, they would still consider each other friends. Pancham and Chespin are not brought together through conventional “friendship traits” – that is, they’re not friends because they’re nice to each other and have fun with each other. Instead, the core, binding principle between Pancham and Chespin seems to be passion. Both Pokémon are passionate about being the best and competing with others to prove themselves more worthy. They are rivals, looking to the other to find ways that they can prove dominance to others. But, it is clear that they are rivals and not enemies, because, when they face a common threat (such as Team Rocket), they were able to bond together to win the battle. The relationship between these two Pokémon touches on some characteristics that people should thrive to develop in their own friendships. Friendships formed through kindness are shallow – they are quick to form and quick to break. Friendships formed through passion may appear rough on the surface, but are more meaningful – not being afraid to call each other out on problems and giving each other fuel to succeed are a few things that will help make friendships deeper and more intricate. The episode opens with Ash and Serena training their Pokémon, and Clemont working on some new in­ven­tions. With permission, Bonnie leaves to explore the forest, but quickly encounters three other children who are guarding it who won’t let her through. Bonnie finds out that they are part of the Lapras Defense Force, and the chil­dren invite Bonnie and Dedenne to join them. After swimming into the water, Lapras comes out. A flashback begins of the first time the children met Lapras, and how they helped Lapras’ hurt fin. To pro­tect Lapras, they formed the Defense Force. The children then explain that Lapras got hurt because of grown-up hunters. Back at the Pokémon Center, the heroes realize that Bonnie is still missing, and hope that she is okay and staying out of the rain that just started. In the forest, Bonnie and her new friends are safe inside a cave and eat candy together with Lapras. 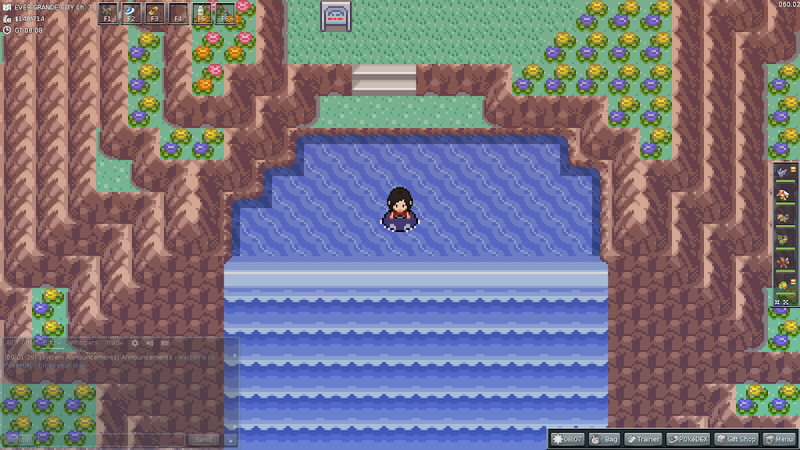 Ash, Serena, and Clemont leave to go search for Bonnie, and find her with an injured Lapras. Clemont de­cides to take Lapras to Nurse Joy, but the Lapras Defense Force tell him he can’t, because all grown-ups are supposedly liars. They reference a time in the past when their teacher claimed she wouldn’t do anything, then took away an Eevee that the kids were nursing back to health. Eventually, the heroes convince the Lapras Defense Force that getting Nurse Joy would be the best option for Lapras. When Nurse Joy arrives, she gives Lapras some medicine and says that Lapras will be just fine. She also explains that the Eevee they were caring for has been returned back to its trainer. Shortly after Nurse Joy’s departure, Lapras shows signs of distress again. Clemont figures that it’s because it misses its family, and wants to bring Lapras back to the ocean. The Lapras Defense Force is upset be­cause they don’t want Lapras to leave, but are eventually convinced that they need to do what’s best for Lapras. 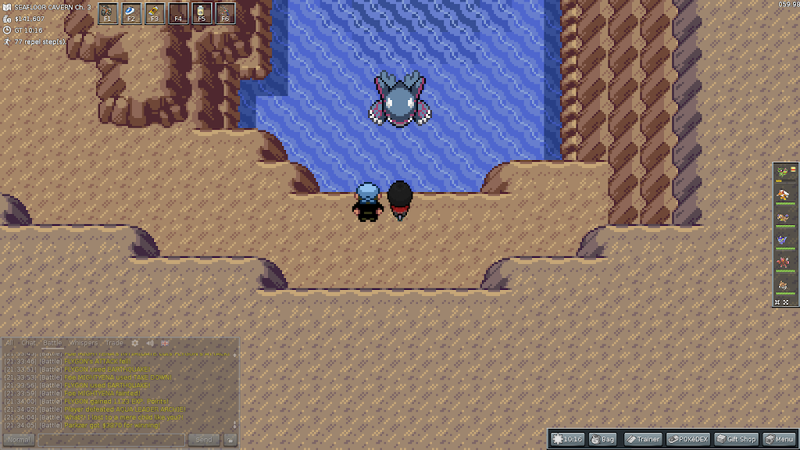 As Lapras swims back to the ocean, they encounter a boulder blocking the way. 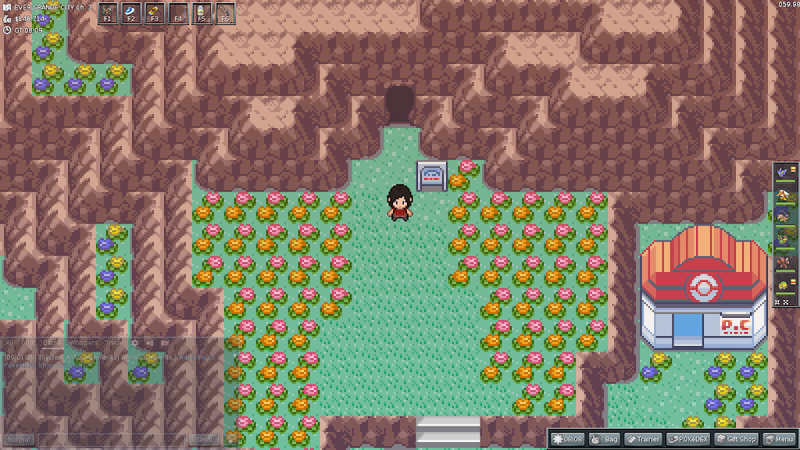 The heroes send out their Pokémon to help remove the boulder from the path, and continue on their way. Right before they see the opening to the ocean, Team Rocket appears to attempt to steal Lapras. Ash decides to dispatch the Lapras Defense Force to take Lapras safely back to the ocean while the heroes deal with Team Rocket. However, Team Rocket appears to have predicted this to happen, as James is already standing and waiting by Lapras’ escape path. He attacks Lapras, sending it into confusion, then tries to grab on to it. The Lapras Defense Force reacts by jumping on Lapras and trying to snap it out of confusion. They succeed by feeding it some candy. Team Rocket engages in an all-out brawl with Lapras, trying to weaken it again so it can capture it. Lapras fights back for a while, then gets the assistance of its family of two other Lapras, that have come in from the ocean. With two powerful Ice Beams, Team Rocket is frozen in place, and Ash finishes them off by making them blast off again. The episode closes with Lapras and its family in the ocean. Lapras bids the Lapras Defense Force farewell, and the children hope that they see Lapras again someday. This episode is a classic illustration of children not having the capacity to identify the depth of adult think­ing, and assuming that adults have poor intentions. They are unaware that adults tend to have the bigger picture in mind when taking actions, and the children generally only focus on what they can immediately see happening. This story can serve as a lesson to adults as much as it can serve a lesson to children. Sometimes, all that children need is a little bit of explanation. Children are often disregarded because they are assumed to be too young to understand what’s happening. However, with a little explanation (i.e., “I need to take Eevee away because it belongs to someone else”), it can be very easy to pacify children and teach them the right thing to do. The episode opens with Clemont and his friends returning to his schooltown. While Pikachu and Dedenne are taking an electric shower in one of Clemont’s inventions, Clemont encounters one of his old friends. Characteristically, Bonnie tries to get her to be Clemont’s girlfriend. She takes the heroes on a tour of the school and explains how it focuses on electric-type Pokémon. Clemont is remembered as a very notable graduate. Clemont has a flashback of his times as a student and meeting Shinx, the motivation for making the Clemontic Shower. He explains how he received great recognition for his invention. Meanwhile, Team Rocket is hiding in the bushes and wants to steal all the electrical energy for themselves. They attach a tool to an electrical supply and start their work. This causes a problem with the transmission cables and transformer, and prompts staff to check on the issue. The heroes and the plant staff find Team Rocket stealing electricity, and chase after them. During the pursuit, they encounter a Luxio that lives inside the plant and has made it its home. Luxio and Clemont make eye contact, and Clemont realizes that this Luxio is Shinx, after it evolved. However, it seems like Luxio does not recognize Clemont. During this confusion, Team Rocket appears to have gotten away. The heroes and the staff regroup to come up with a plan. Later that day, Clemont goes back to his flashback and finishes his story. Apparently, he wanted to meet up with Shinx on the day of his graduation, but he was taken away by the mayor to attend a dinner before he had the chance. Clemont assumes that this caused Shinx to receive a false impression that it had been abandoned, even though Clemont wanted to be its lifelong partner. Suddenly, the power goes out in the hotel, and the heroes run out to find out what’s wrong. As the heroes approach Team Rocket’s location, Luxio tries to stop them single-handedly, but fails. The heroes try to convince it to stop battling Team Rocket, but it refuses, because it wants to create a world where all Pokémon live happily – the goal Clemont had back when he was a student. As Team Rocket throws the finishing move onto Luxio, Clemont jumps in the way, blocking Shadow Ball and absorbing the shock. Luxio begins to recall memories of the time it spent with Clemont, and starts licking Clemont’s face. With this restored bond and coordination, Clemont and Luxio battle together, defeating Team Rocket and sending them blasting off. As time ticks deeper into the night, the energy gets restored to the town. Clemont finally makes his proposal to Luxio, and asks to meet him at the same place at the same time as originally planned if it accepts his offer. The following day, Clemont and his friends wait for Luxio at the square, but Luxio doesn’t show up. Clemont decides he will give up because this is what he deserves, and starts to walk away, but right at that moment, Luxio pops out of the brush, agreeing to join Clemont on his journey. Clemont catches Luxio, making it the newest member of the team. Clemont has always been on the slightly mysterious side, being noticeably older than everyone else and apparently brilliantly smart, but not much being revealed about his past. He also seems pretty secretive, as there was a long period of time early on in the season where he was even hiding the fact that he was a gym leader. It’s always good to tease things about mysterious entities to keep the critical thinking going, and revealing that Clemont is a graduate of an electrical engineering school is a good way to do that. It sheds some light on how he’s able to come up with all these inventions. It seems like the moral of this episode is that things aren’t always as they seem, especially in relationships with other people. There is usually a story behind why people act the way they do, and if the other side doesn’t know about this story, it’s very easy to enter a misunderstanding and jump to conclusions. From Shinx’s point of view, Clemont abandoned it because he didn’t show up at their designated meeting place. It had no clue of Clemont’s true intentions (even bringing a cake along with him), and did not realize that it was an external factor that caused him to miss the meeting. This episode demonstrates the importance of giving people a chance and listening to what they have to say, and encourages people not to hold grudges against others if they might not know the full story behind the other person’s actions.